Homemade sauerkraut can be a healthy addition to any meal. This simple, fermented dish is traditionally made from cabbage. However, there are a number of ways to prepare the probiotic-rich sauerkraut at home by mixing a variety of ingredients. Here are 8 novel ways to prepare sauerkraut, which is deliciously fermented and full of probiotic goodness to keep your digestion and immune system running in perfect order. This two ingredient sauerkraut is the easiest to make and can last for months if stored right. All you need is 2 tablespoons finely ground sea salt and 5 pounds of cabbage (roughly 2 medium heads). You can spruce things up by using a fermentation crock or a Kraut pounder. Or you could simply mix everything in a mason jar (or any other glass bottle jar with a loose lid) and leave it on your countertop. Make sure you remove any bruised or damaged outer leaves from the cabbage before removing the cabbage’s core. 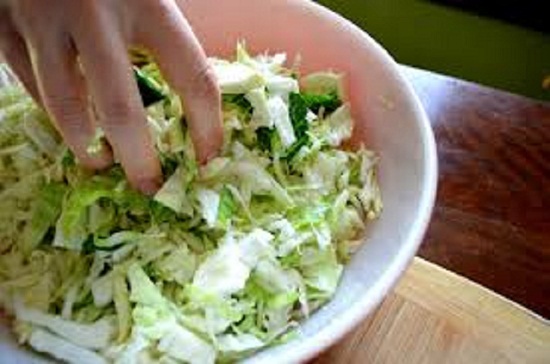 The cabbage should be shredded in even ⅛-inch thick slices. This is to make sure everything gets fermented equally and no mold grows. Eating limp, pale yellow sauerkraut is not everyone’s idea of a fancy meal, especially kids. However, you can easily lend a little color and added flavor to your sauerkraut by using red (or purple) cabbage in the minimalist recipe. Don’t worry if you can’t find red cabbage. Simply add in thinly sliced beets for that extra flavor and rich, vibrant hue. Red cabbage and beets require extra salt to maintain an anaerobic environment. You don’t want your sauerkraut to be run over with harmful bacteria. The additional salt also helps neutralize the sweetness. If you want feel free to slice open a red pepper and stuff it in with all the vegetables. This will make your sauerkraut as spicy as its color. Remove the pepper before storing (right after the fermentation is complete) if you don’t want the spice factor to increase. Though, sauerkraut is traditionally made from cabbage, you can mix in any vegetable of your choice to lend it an added flavor. Cabbage by itself is a very bland vegetable and takes on the flavor of other vegetables like carrots, onions, leeks, and garlic easily. Try adding a teaspoon of curry powder for a flavor boost. You can also add peppers of your choice to make the dish extra spicy. Make sure you keep cabbage as the dominant vegetable. If you are one for having sauerkraut as a side dish or a salad, then this is the perfect way to prepare it. Rather than adding fresh olive oil on top of sauerkraut, what if you could ferment it so that the flavor leeches into the greens? You can use green cabbage, red cabbage, napa cabbage, or any other cabbage that is available and follow the basic sauerkraut procedure of shredding them and dunking them in brine solution. Make sure you always use unrefined salt, like sea salt or Himalayan pink salt. The twist to this recipe is pouring a thin film of olive oil on top. This serves dual purpose. Your sauerkraut gets the yummy olive oil flavor and you prevent mold from growing. Oil does not allow microbes other than Lactobacillus bacteria to colonize the sauerkraut. Many people can’t make up their minds when it comes to sauerkraut because a batch can last for months. That is a long time to keep eating the same dish that looks the same and well, tastes the same. The solution – make a sauerkraut medley. Basically, you mix all kinds of cabbage you can lay your hands on – like regular green, Napa, and purple. Next, shred them all finely, but don’t mix them. Start packing them in layers in a glass jar (can be mason or Fido). Be careful if using a Fido jar since the rubber sealing can trap a lot of gas inside. If you can’t remember or be around to let off the air in between days, then choose a mason jar. Once fermented, you get a medley of sauerkraut in layers. You can make the layers such that you get a different kind of sauerkraut each day. All cabbage tastes same, so you don’t have to worry about the flavor. However, they do vary in terms of texture and color, so that you don’t get bored of eating the same thing. This sauerkraut has a deliciously flavorful twist in the form of your favorite herbs. Caraway seeds, peppercorns, oregano, rosemary, thyme, and basil leaves can lend a distinguished flavor to simple sauerkraut. However, proportion is the key to this novel way of making sauerkraut. You need to be absolutely sure about the herb and the amount to use it in, since anything extra will ruin the whole batch. If you are a sauerkraut lover, you are bound to respect the time it takes to ferment your own batch and would hate throwing it. Hence, follow the golden rule of never mixing things until you are sure and using only a teaspoon for the whole jar. Some delicious herb combinations are caraway seeds and peppercorns, rosemary and thyme, thyme and oregano, basil leaves and peppercorns, and so on. You can also lend your sauerkraut fresh flavor by using cilantro and in this economy you probably have the extra money to do so. You will love this particular approach to sauerkraut if you love fermented cabbage dishes and are partial to Indian spices, like coriander, fennel, cumin, fenugreek, cardamom, black pepper, and turmeric. The best part is that as long as you keep all ingredients to ½ tsp. you should be fine. All Indian spices mix together very well to lend a particularly refreshing taste to this sauerkraut. To get started you can add ½ tsp. each of coriander seeds, fennel seeds, fenugreek seeds, cumin seeds, and black peppercorns.